Circle K is an international, student-led community service club with over 15,000 members on college campuses across 18 countries. Part of the Kiwanis Family of non-profit organizations, Circle K offers its members opportunities for service, fellowship, and leadership. Circle K is organized into subregions, districts, and individual clubs. Each year, new international and district projects are introduced that are intended to make an impact in local and global communities. New Jersey Circle K Scholarship! Download the document below to apply for Scholarship offered by New Jersey Circle K and submit it to Mickey Cohen at mickeyrc.cki@gmail.com by February 8th, 2019. 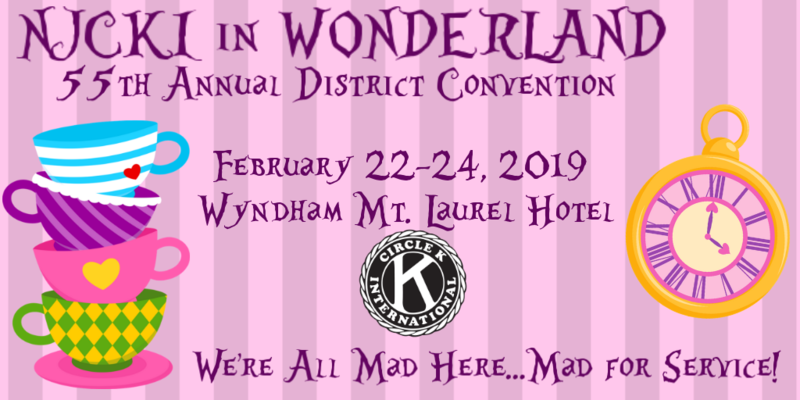 New Jersey District Convention (DCON) 2019 is happening on February 22-24, 2019 at The Wyndham Mount Laurel Hotel, we hope you are able to join us for another fun weekend of service, leadership, and especially fellowship with all of our friends around the district! Click the picture for more information! Get for DCON with Delegate forms, Elections Packet, and Amendments!